Peter Eisert, a homeowner from Excelsior, Minn., testifies at a foreclosure moratorium “people’s” hearing held by state Sen. Scott Dibble and Rep. Karen Clark (DFL, Minneapolis). Their bill, HF 1886/SF 1521, would provide a temporary moratorium on foreclosures in Minnesota. The legislation is largely symbolic, though, because the Republicans in power are unlikely to push it forward. Eisert claims he was misled by Wells Fargo Home Mortgage and unable to get a home loan modification. The value of his home, where he has lived since 1994, has fallen to $96,000 and he has fallen behind on payments. Eisert was forced to file bankruptcy in order to remain in the home. He has requested accounting information from the bank but says he has never received it. To add insult to injury, during a recent conversation with a loan modification officer, Eisert was asked if he was recording the conversation, and that if he was, he was told the conversation would not continue. Rep. Clark offered that she or her colleagues could reach out to Wells Fargo’s lobbyists who often visit the State Capitol and attempt to help Eisert. 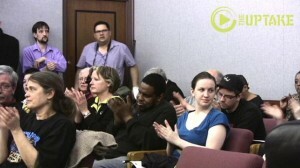 Click here to watch the entire foreclosure moratorium “people’s” hearing and press conference that preceded it. In addition to shooting videos for The UpTake, Jacob Wheeler is a contributing editor at the progressive political magazine In These Times, publishes the Glen Arbor Sun in his native Michigan, and authored "Between Light and Shadow," a recent book about the Guatemalan adoption industry. Wheeler's stories have appeared in such magazines as the Utne Reader, Earth Island Journal, Rotarian and Teaching Tolerance magazine, and newspapers including the San Francisco Chronicle and Christian Science Monitor. He speaks fluent Spanish, German and Danish. Macalester alumni are upset over the Saint Paul-based liberal arts college's crackdown on student activism. The Kicks Well Fargo Off Campus campaign seeks divestment from the bank for its involvement in the housing foreclosure crisis. Push for Anti-Foreclosure Legislation Wins Abbreviated Homeowner "Bill of Rights"
Green Party vice presidential candidate Cheri Honkala said that, were she and presidential candidate Jill Stein to win Tuesday's election, the first thing they'd do would be to enact a moratorium on foreclosures in the United States of America." This year's Pride parade had something extra to celebrate — a U.S. Supreme Court ruling making marriage equality the law in all 50 states. The parade attracted the usual colorful assortment of marchers and floats as well as many politicians.